The Oasis Water Node Trap is a Hydro type weapon. The Oasis Water Node Trap is not sold by any Trapsmith. It can only be crafted given the proper ingredients. The Oasis Water Node Trap (if unintentionally smashed) can be reassembled from Oasis Water Node Trap Parts. A complete list of Oasis weapons weapons can be found here. A complete list of Hydro weapons can be found here. Smashing this weapon with the Hunter's Hammer yields Oasis Water Node Trap Parts. 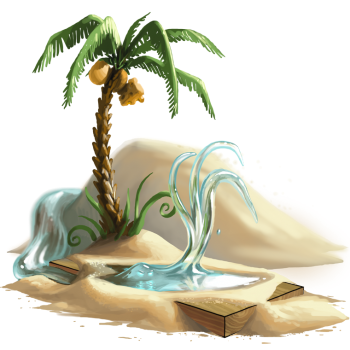 26 March 2011: The first Oasis Water Node Trap was crafted. 14 Nov 2012: The Oasis Water Node Trap became smashable and the reconstruction recipe was introduced with the opening of the Living Garden. This page was last edited on 27 January 2019, at 01:20.